If you need your chimney cap repaired or replaced, you’ve come to the place. Early Times makes it easy to get a free quote. Just fill out the form below to get started. Chimney caps are an often forgotten but extremely important part of your home – especially during the winters when small animals such as squirrels are looking for shelter from the weather. That’s why it’s important to make sure that your chimney caps are working properly. Early Times Home Solutions offers many different sized and shaped chimney caps. They can also be made from stainless steel, copper and black galvanized steel. We want to make sure we get the perfect chimney cap for your chimney and budget. Every chimney should have a chimney cap because they protect your home from getting invaded by animals and bugs. 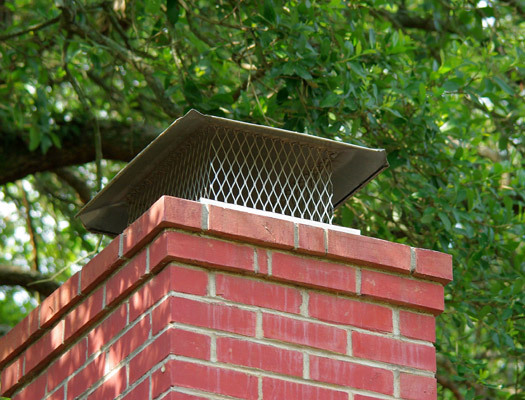 They cover the flue and prevent anything from crawling down and into your chimney. Some chimney caps can even cover the entire chimney. Since the top of the cap is slanted away from your chimney and extends beyond the opening, it helps keep water out of your chimney. This helps prevent water damage to your chimney liner and chimney walls. Drafts coming down your chimney can be a major problem for your home’s energy efficiency. Chimney caps are designed to stop drafts from coming down your chimney and into your home. You can read more in our article about the benefits of chimney caps. When Chicago homeowners need their chimney caps repaired or replaced, they come to Early Times Home Solutions. We’ve been keeping homes clean and safe in Chicago since 1985. Our experts will come to your home to inspect your current chimney cap or measure your chimney for a new one. We’ll then make sure that your new or repaired cap is working properly for years to come. Get a free quote by filling out the form above.